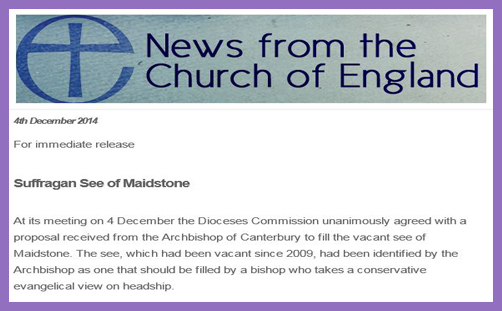 At its meeting on 4 December the Dioceses Commission unanimously agreed with a proposal received from the Archbishop of Canterbury to fill the vacant see of Maidstone. The see, which had been vacant since 2009, had been identified by the Archbishop as one that should be filled by a bishop who takes a conservative evangelical view on headship. This flows from the public commitment given by the Archbishops and the House of Bishops, in the run up to the final approval by the General Synod of the legislation to allow women to be admitted to the episcopate in July 2014 (see paragraph 30 of House of Bishops Declaration and the Archbishops’ note of June 2013- GS Misc 1079). In agreeing with the proposal to fill the see the Commission was conscious of the needs of the national church for a member of the College of Bishops to be able to act as an advocate for those who hold a conservative position on headship. It made its decision on the understanding that the bishop would foster vocations from those taking this position; that he would undertake episcopal ministry (with the agreement of the relevant diocesan bishop) in dioceses in both Provinces where PCCs have passed the requisite resolution under the House of Bishops’ declaration; and that he would be available to act (again by invitation) as an assistant bishop in a number of dioceses. While available to take his place in the Foundation of Canterbury Cathedral, the Commission understood that – given his potentially wide geographical remit – the bishop would not otherwise be expected to participate in the life of the Diocese of Canterbury. The necessary steps to make the appointment will now begin. • Part of the normal statutory process for filling suffragan sees is for the Dioceses Commission to consider, on behalf of the national church, whether to agree to a proposal from a diocesan bishop to fill such a see. • Suffragan sees are normally filled within a short time frame but the See of Maidstone was left vacant following a diocesan decision to appoint an additional archdeacon. A curious episcopal model is emerging in the Church of England, in which episcopal unity gives way to representative proportionality: if +Buckingham is liberal, Maidstone must be conservative; if ++Canterbury is white, ++York ought to be black, and so on. We can see where identity quotas are ultimately leading, of course: if ++York is male, ++Canterbury must be female. And Lord knows where minority sexualities will need to fit in. Theological unity becomes subordinate to ecclesial expedience. Orthodoxy gives way to pluralism and relativism. But this press release raises more than a few questions. Precisely how conservative and evangelical will the Bishop of Maidstone be permitted to be, for are there not spectrums of conservatism and evangelicalism? Is not the evangelical view the biblical view? Will the Bishop of Maidstone be permitted to foster vocations from those who refute the possibility that women may be bishops or even that priestly headship may be female? May he, for example, be a member of Reform, which holds “the divine order of male headship, which makes the headship of women as priests in charge, incumbents, dignitaries and bishops inappropriate”? Who will preside at his installation? Would he accept ordination by a bishop who ordains women? And where will he find the time not only to minister in Maidstone but effectively to function as an assistant bishop of every diocese that calls on him? While the media is fixated on who will become the Church of England’s first woman bishop, this appointment is actually rather more interesting, for the potential of this post to become a corporeal symbol of spiritual disunity is considerable: For when one says, “I follow Buckingham,” and another, “I follow Maidstone,” are you not mere human beings?” And when one says, “I follow Francis,” and another, “I follow Benedict,” are you not in exactly the same boat?